Do You Want Your Windows to Stay Cleaner For Longer? Even when the interior of your home is spotless, if the glass panes are dirty, it won’t look as it should be. Smear-free and sparkling windows make the perfect finishing touch to a well maintained house. But we all know it’s a very time-consuming and sometimes boring task to do on your own. Here is the solution to all that – hire our local, licensed and insured window washing teams. We cover all ZIP codes in Des Plaines, Park Ridge, Elk Grove Village and Niles. Using only distilled (purified) water in the cleaning process removes dust and dirt with less detergents that would otherwise be necessary. It also leaves a smooth finish, that actually reflects new dust particles after washing, so your windows will stay cleaner for longer. This service includes washing of all glass panes, PVC frames and window sills. 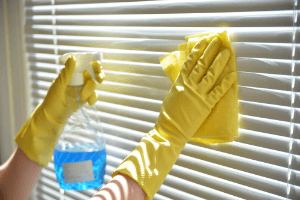 Cleaning windows and other glass surfaces might look easy enough, but if you’ve ever tried to DIY, you’re fully aware of how annoying can be all stubborn stains, fingerprints and smudges. Forget about the old fashioned techniques of using vinegar and newspaper to make your windows shine and stop scrubbing the glass panes for hours. We use distilled water and specialized water-fed extension poles to reach hard-to-get corners and windows on higher floors, removing water spots and grime from the safety of the ground level. This also allows us to clean paint and plaster, kid’s drawings and other types of stains with ease. After the washing, special polishing solutions are used to make the glass surface gleaming and nearly transparent again. What Makes Our Window Cleaning and Washing Services Better?